Every year the first taste of the new wine harvest is eagerly anticipated in France and around the world. Parties are held, bottles are uncorked, and the first sips of Beaujolais Nouveau are savored. But since this is a young wine, it would be out of character to get too serious at this party. A relaxed attitude in both presentation and attire should be the order of the day. After all, until the first bottle is uncorked, no one quite knows what to expect from it—so be prepared for surprises! In keeping with the casual spirit of this occasion, a French wine and cheese party has the perfect laid-back but festive attitude. Although Beaujolais Nouveau is the reason for the party, its light, fruitiness goes best with mild flavors. Therefore, add interest to your event with a variety of French wines that will accompany a broad selection of French cheeses that range from mild to pungent. Provide at least two wine glasses per person, one for white and the other for red. Give your guests wine charms with their glasses. These terrific inventions eliminate the guesswork of deciding which glass belongs to you after you've put it down for a moment. Decorate with large bunches of colorful balloons. This creates both a youthful and celebratory mood for your party. Set your table with a dark-hued, colorful tablecloth. That way the predictable spills will not be as noticeable. Have plenty of small plates on hand for the cheeses and other nibbles you'll be serving. Line a few simple serving platters with cheese leaves to show your choices to best effect. Place a card with the name and background information for each cheese beside it. Present an assortment of French cheeses that range from mild to pungent. This selection will help you get started, but ask your local cheese merchant for other suggestions. Begin your party with the Beaujolais Nouveau and its recommended cheeses before moving on to the more pungent cheeses and other wines. That way the Beaujolais Nouveau won't be overpowered by the stronger flavors. Camembert: This lovely, seductive cow's milk cheese will go well with the star of your party, the Beaujolais Nouveau, or with any champagne ​bottles you pop to mark the occasion. Brie: This cheese is one of the classic pairings for Beaujolais Nouveau. It's creamy; the mellow flavor will go beautifully with the wine. Morbier: A pungent, buttery cheese, Morbier will also go nicely with the Beaujolais Nouveau. Bucheron: This aged, goat's milk cheese pairs well with a robust Bordeaux. For white wine, you might serve a Sancerre or Pouilly Fume. Mimolette: Colorful Mimolette is a strong, salty, cheese along the lines of cheddar, that would complement a dessert wine well. Roquefort: This famous, pungent sheep's milk cheese is often referred to as the "King of Cheeses." The best pairing for this cheese is a fine dessert wine such as a Port or Sauternes. Accompany your cheese board with a selection of crackers, French Baguettes, grapes, nuts, and pears. Remember to finish the party with a simple selection of buttery French desserts such as Almond Tart, Madeleines, or Cinnamon Palmiers, and don't forget the French Roast coffee. 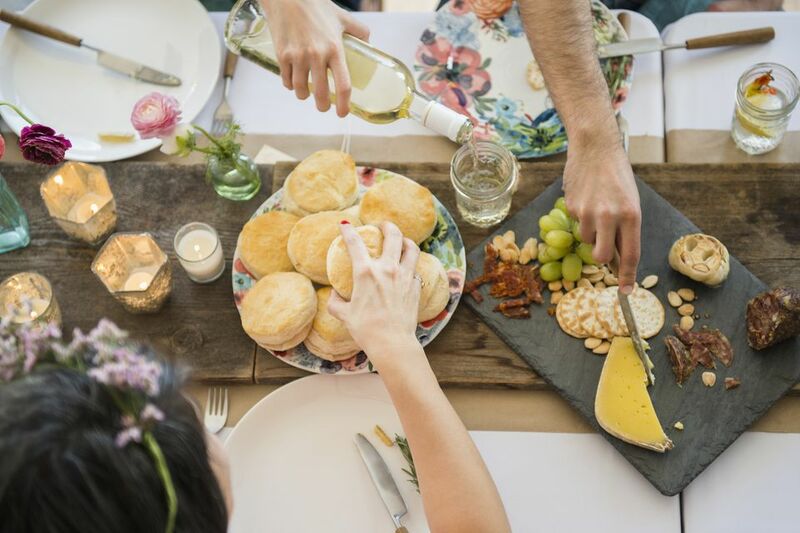 With cheese, wine, French desserts and a robust cup of coffee, your guests may be wishing that Beaujolais Nouveau was more than a once-a-year event. What is the Best Way to Host an Afternoon Tea Party? Can I Ask Guests to Share the Bill at a Party I Host?